The Ontario legislature is currently considering adopting Bill 153, The Organic Products Act. The Bill is open-ended, but the intention is to adopt the Canadian Organic Standards in Ontario and require that all products labelled as organic be certified. At the same time, OCO is hoping to develop a made-in-Ontario solution to ensure that certification is inclusive and appropriate for organic businesses of all scales. 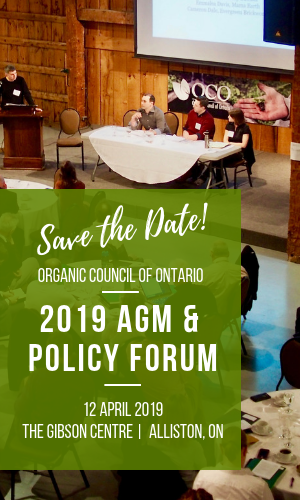 The Organic Council of Ontario is seeking your input on how to do this, particularly with respect to small-scale producers and businesses. With funding from the Trillium Foundation, we will be discussing the issues with producers and businesses from across the province over the winter season. This survey should take approximately 30 minutes and will provide valuable information to the Ontario agri-food community. We thank you for your participation. You must leave your contact information to be considered. If you have any additional comments or questions or would like to participate in a focus group, please contact john@organiccouncil.ca. Funding for this research has been provided by the Ontario Trillium Foundation. 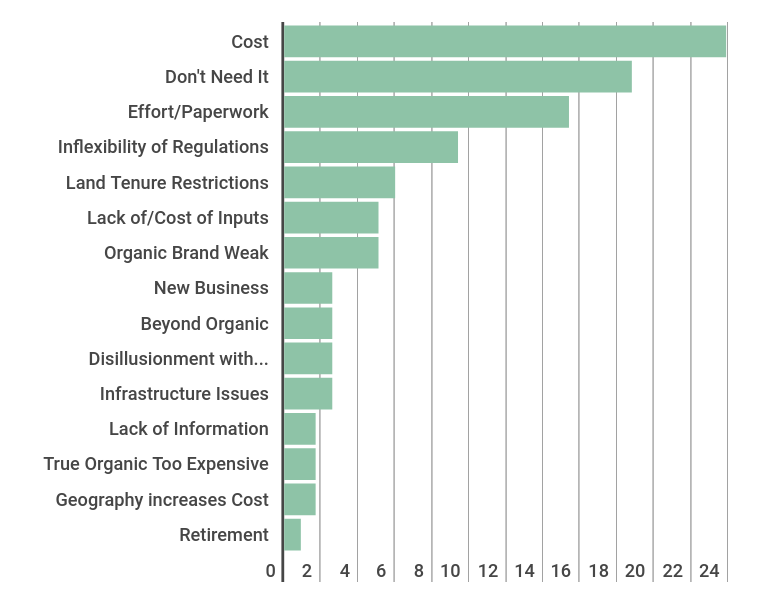 As well, comments from the "other" category described frustrations or disenchantment with the organic standards and/or certification system, the inability to find organic inputs, or the fact that direct marketing did not require certification. Producers who had dropped certification also identified a number of challenges. Chief among these was the belief that certification wasn't worth the cost or effort, as well as the expense, not having a business need for it, and the amount of paperwork required. 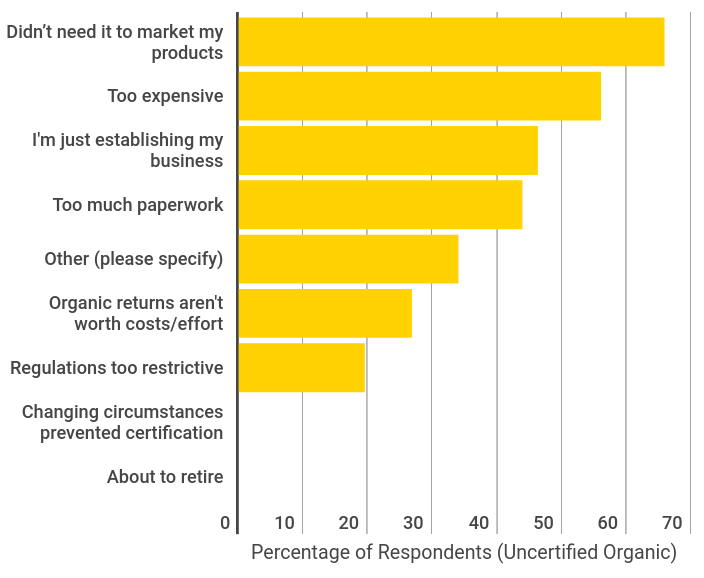 Survey respondents were also asked how much they spend on certification annually. The majority of producers (78%) spend less than $1200.00 annually, with over one third spending between $600.00 and $900.00 annually. Less than one quarter of producer respondents spend over $1200.00 on certification. Over 90% of organic farms with under 10 acres in production paid under $900.00 in certification fees. The one respondent who paid more was a dairy farmer. 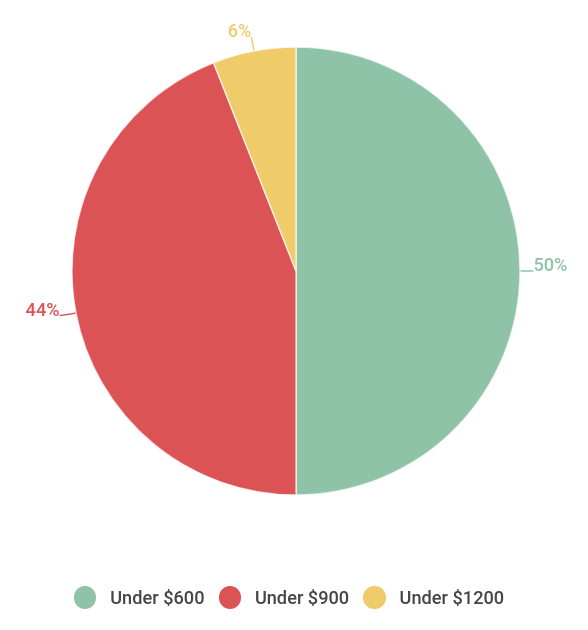 Of those who paid under $900.00, the majority paid less than $600.00 annually. In 2014, the Organic Federation of Canada's Working Group on Small Scale Organic Certification (WGSSOC) conducted a survey looking at challenges facing smaller producers on the issue of certification. 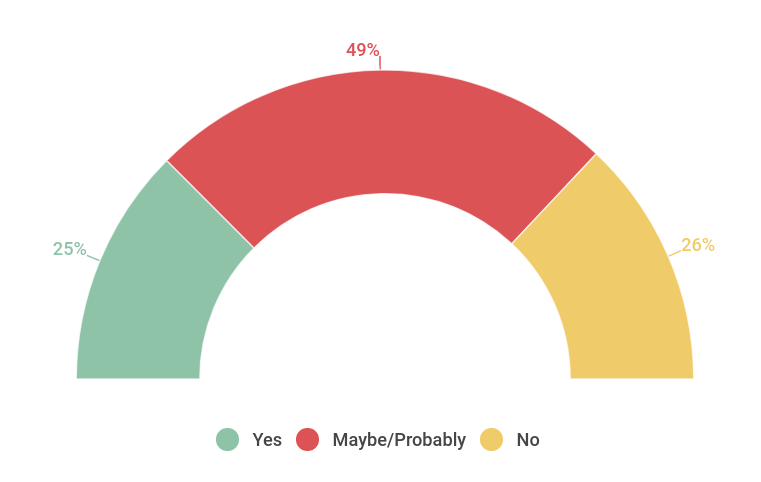 As part of its findings, the working group outlined two possible models as alternatives to third-party certification: peer review and a pledge system.